If you're in the market for a new wall mount chimney range hood (installed against a wall) and are looking for range hood reviews, you've come to the right place. It's easy to get overwhelmed by the sheer amount of chimney range hoods available, especially since they all look somewhat similar. 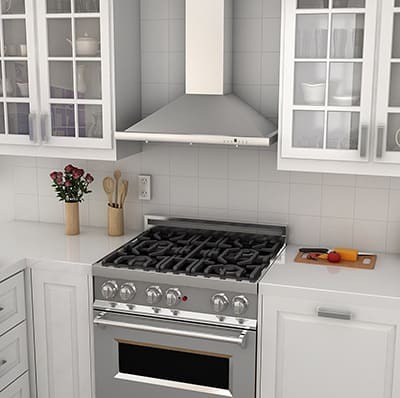 Since most people don't know what to look for when buying a range hood and don't have the time and/or energy to dive into the world of range hoods, we've done the hard work for you. We have picked out the 5 best wall mount chimney range hoods of 2018 and wrote range hood reviews for all of them. Event though none of the wall mount chimney range hoods in our list will be a bad choice, you should get the one which fits your situation best. 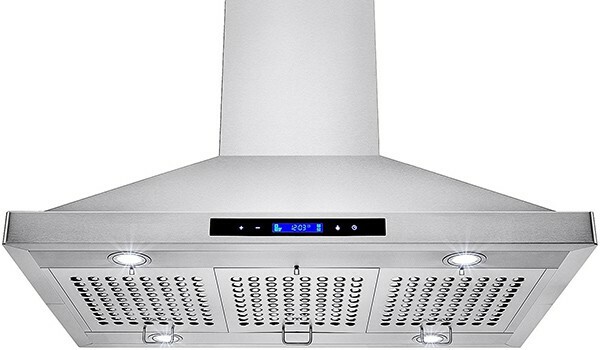 We hope this range hood reviews top 5 will prove useful to you. The number 3 spot on this list of range hood reviews is occupied by a 30 inch range hood by FIREBIRD. 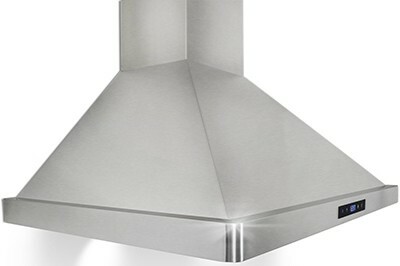 The first thing which stands out about this this wall mount range hood is that it's absolutely beautiful. The combined use of glass and stainless steel gives off a very modern and eye-catching feel. We're glad that Firebird opted for LED lighting, instead of halogen bulbs, as LED lighting is much more energy efficient and durable. The blue-ish tone of the tested model was a nice touch. It’s not just the outside of the range hood that’s impressive, as there’s a powerful 760 CFM motor hidden under the beautiful exterior. ​An important part of range hood reviews are discussing possible flaws. While some websites might solely focus on the positive parts in order to sell more (at the cost of you, the consumer), here at Rangehoodguide.com we don't play that game. Let's talk about issues we came across. Wall mount chimney range hoods are usually fully made out of stainless steel for a reason. Although the glass makes it look absolutely stunning, it also comes at a price: there's only room for 2 small mesh filters. 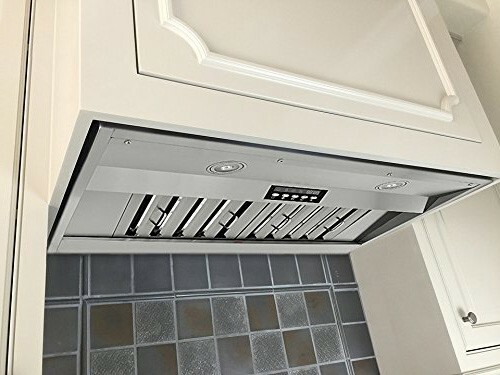 Usually, almost the whole bottom part of a range hood should be made up of a range hood filter, because it’s where the air pollutants (resulting from cooking) will come in contact with the range hood. However, a big part of this range hood model is made up of glass, which results in a shortage of space for bigger (or more) filters. It seems that the manufacturer was aware of this and tried to compensate for it by putting in a more powerful fan, but that too comes at a price: more noise at the highest speed. ​Another flaw is the installation of the range hood. A lot of people seem to have had trouble with the installation of the range hood. We must say that the instructions for the installation are very limited and installing the range hood requires at least 2 people. It’s also advisable to wear gloves while installing this range hood so as to not cut yourself, as the range hood contains some sharp edges. Looks very stylish. The blue LEDs are a nice touch. The number 4 spot on this list of range hood reviews is occupied by a 30 inch range hood by AKDY. This range hood looks like a straightforward, simple, but stylish addition to any kitchen. The stainless steel finish goes well with the blue tones of the LED lighting, which gives off a very modern feeling. To be honest, the range hood looks more expensive than it actually is. Out of all the wall mount chimney range hoods in this list, this is definitely one of the most beautiful ones. A great bonus is that the range hood is really light. As with almost all range hoods, there are some minor flaws. Partly due to the blue tones of these particular LED lights, they seem to come off as somewhat dim. They don’t seem to give off as much light as the LED lights in other range hood models. What doesn’t help either is that they’re located at the back, instead of the (more common) front. 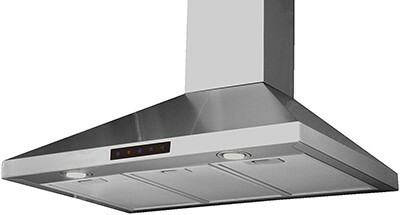 Another topic we have to highlight in our range hood reviews is the amount of noise the range hoods produce. The AKDY 30" AZ-63175S seems quite noisy. 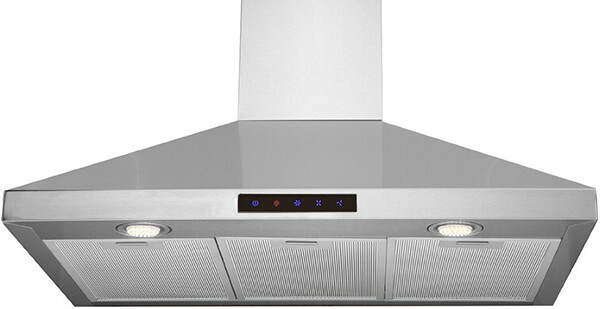 Even on the lowest setting, it seems to give off more noise than other range hood models. Speaking of sound, even the LED touch panel control is really loud (smoke alarm intensity) and every touch or command gives off this loud beep. Lastly, the installation is quite tricky. To somewhat counter this flaw, make sure to have at least two extra hands to help with the installation. If you can overlook these flaws, this range hood is a great choice, especially if you’re looking for a great price/quality ratio. The number 3 spot on this list of range hood reviews is occupied by a 30 inch range hood by CAVALIERE. 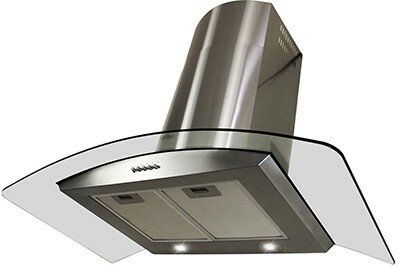 This range hood, with its brushed steel finish, is very stylish and will fit perfectly in any modern kitchen. 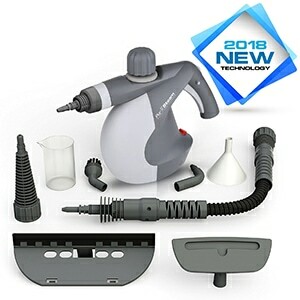 It's powerful 900 CFM centrifugal motor will be a great aid in capturing all the smells, fumes and oil. However, some might find it a bit noisy on the higher speeds. But as we all know, it's always a trade-off. 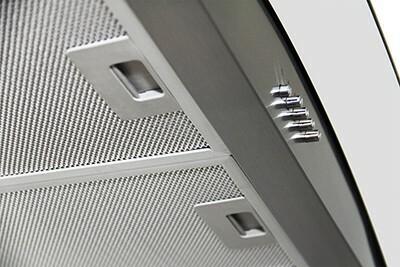 The more powerful the range hood, the noisier it will be. Please note that the description on Amazon might not be totally accurate. The manual clearly states that it includes halogen lights (instead of LEDs), aluminum mesh filters (instead of baffle filters) and has 6 fan speeds (instead of 4 speeds). 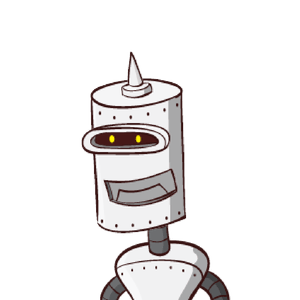 The model we've tested matched the description in the manual. Note: the manual states that it comes with aluminum mesh filters instead of baffle filters. The number 2 spot on this list of range hood reviews is occupied by a 30 inch range hood by Kitchen Bath Collection. First of all, this range hood is beautiful. It has a sleek and modern stainless steel design. The touch control panel in front and the bright LED lights really makes this range hood a great addition to any modern kitchen. What’s even better is the relatively low price. Out of all the wall mount chimney range hoods in this list, this one will probably give you the most bang out of your buck. We do want to touch on some shortcomings of this range hood. 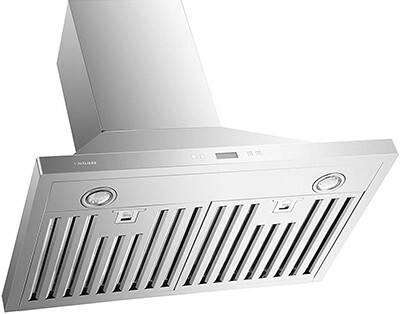 Firstly, even though the design might be very sleek, the relatively thin steel makes the range hood feel a bit flimsy. The second (potential) flaw is the loudness of the range hood. 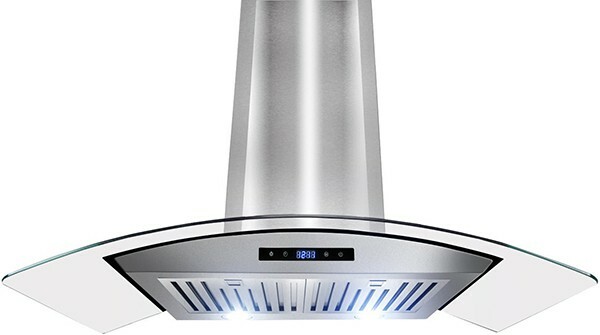 Though subjective, we can imagine how some people might find the range hood to be a bit on the loud side (around 3.5 sones). We at Rangehoodguide.com didn’t find it all that disturbing. We did find the beeping sounds of the touch screen a bit on the loud side. The LED lights are both a pro and a con. 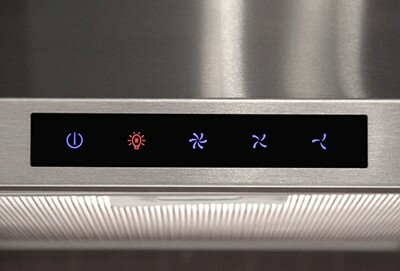 Having LED lights in your range hood is generally a great thing. The supplied LED lights in this model are very bright though. That shouldn’t stop you from buying this range hood though, as you can always swap them for different ones (check with the manufacturer first so as to not void the warranty). 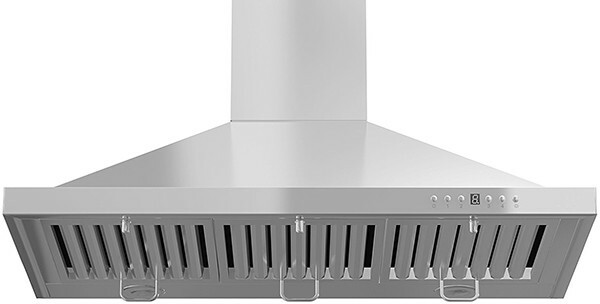 The relatively low price, modern design and adequate fan motor make this range hood a great deal. Though there are some minor flaws, the great features more than make up for them. No visible welded seams on any of the 3 sides. According to some customers, there is no extension available for this model (these need to be custom made for you for a lot of $). 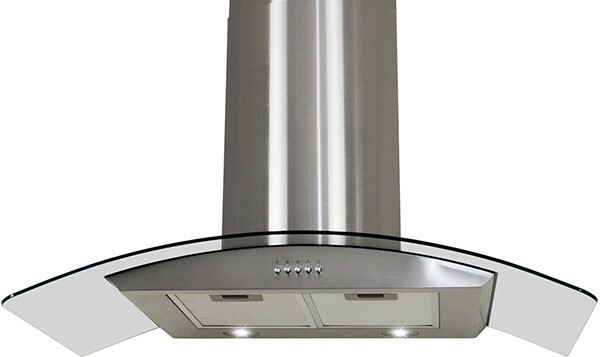 Be sure to measure your ceiling height before purchasing this range hood. 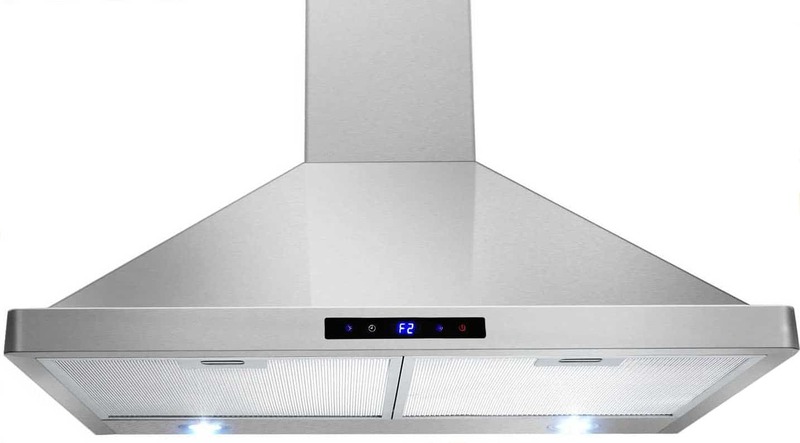 The number 1 spot on this list of range hood reviews is occupied by a 36 inch range hood by Z Line. 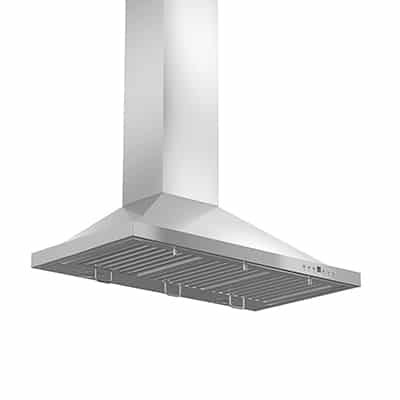 The ZLKB-36 is a great chimney range hood. 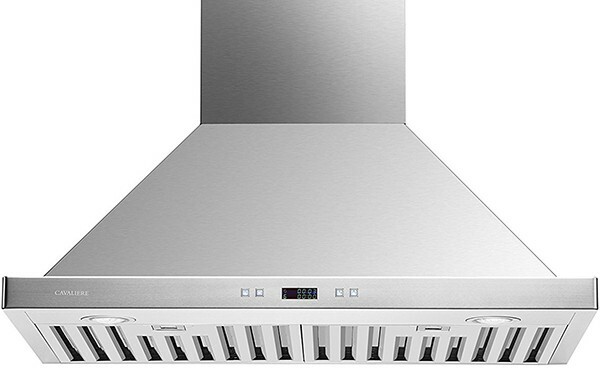 What makes this range hood especially great is its price/quality ratio. 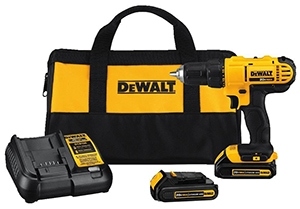 A similar product from other manufacturers would generally set you back a lot more money. 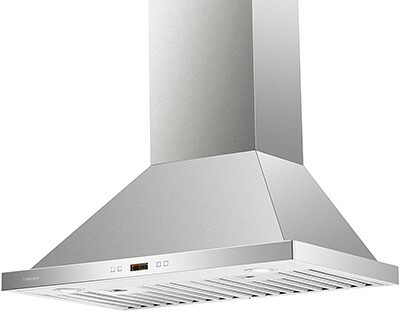 The range hood’s sleek and modern brushed aluminum finish will make it look more expensive than it actually is. However, some details aren’t as robust as we’d like them to be. For instance, the buttons might not push down evenly; the baffle filters might be a bit lopsided (might need a light bending), the supplied screws/anchors might not suffice (you might want to use your own screws to keep the range hood from vibrating). But hey, for this price we can’t complain. The features it comes with are generally exclusive to a higher segment range hoods: powerful 760 CFM motor, 4 speed control (with autotimer, delayed shut-off and LED indicator) , adjustable lighting. 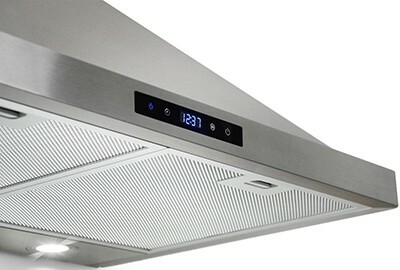 If you want to get the most bang for your buck and look stylish doing so, get this range hood! 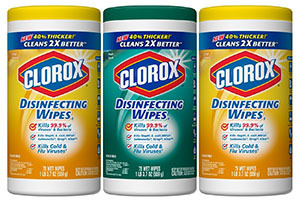 CE, GS, and CCC safety approvals (US and Canada). Kitchens with a high ceiling might need to get this chimney extension.